Pleading the Sixth: On September 28, 2016, the Pennsylvania Supreme Court ruled that indigent defendants have the right to challenge systemic deficiencies at the outset of a case before having to suffer from actual or constructive denial of counsel. Moreover, the Court affirmed that ineffective representation is “all but certain” system-wide throughout Pennsylvania, in ruling that a class action lawsuit may proceed. The 6AC details the problems facing the accused in Pennsylvania in the first part of a two-part series. 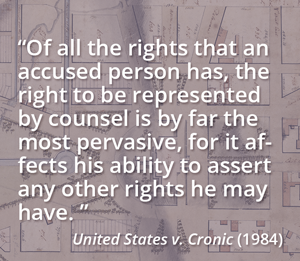 In a nod to the Pennsylvania Court’s decision, Part II details how to use United States v. Cronic to evaluate systemic indigent defense deficiencies. “We recognize for the first time in Pennsylvania a prospective cause of action enabling indigent criminal defendants to prove that the level of funding provided by a county to operate a public defender’s office has left that office incapable of complying with Gideon, creating the likelihood of a systematic, widespread constructive denial of counsel in contravention of the Sixth Amendment to the United States Constitution.” Thus concluded the Pennsylvania Supreme Court in a unanimous decision in a systemic class action lawsuit Kuren v. Luzerne County on September 28, 2016. Luzerne County is the Pennsylvania jurisdiction at the heart of the state’s “kids for cash” scandal, in which two judges were convicted of getting monetary kickbacks from two private juvenile detention centers in return for handing out excessive sentences to increase the number of detainees sent to the facilities. Part of the problem was that the judges routinely denied counsel to juveniles charged with delinquent acts. The Pennsylvania Supreme Court eventually vacated all of the adjudications, and expunged the records of defendants, handled by one of the judges from 2003 to 2008. However, a subsequent report of the Interbranch Commission on Juvenile Justice, mandated to investigate the juvenile justice scandal in Luzerne County and to recommend reforms, determined that, once children were appropriately being appointed counsel, the public defenders were handling in excess of “800 to 1,000” cases per year. To get a sense of how excessive a workload that is, national caseload standards call for attorneys to handle no more than 200 such cases in a year. While the national caseload limits were established and remain as absolute maximums, policymakers in many states have since recognized the need to set localized workload standards that take into account additional demands made on defense attorneys in each case (such as the travel distance between the court and the local jail, or the prosecution’s charging practices, or increased complexity of forensic sciences and criminal justice technology) – all of which increase the amount of time, beyond that contemplated by the national standards, that is necessary for the lawyer to provide effective representation. For exactly this reason, many criminal justice professionals argue that the caseloads permitted by the national standards are far too high and that the maximum caseloads allowed should be much lower. In reviewing the allegations in the class action lawsuit, the Court determined that that there are system-wide indigent defense deficiencies causing circumstances in which “the constructive denial of counsel is imminent and likely, if not all but certain.” [Click here to read a companion piece on how to determine actual and constructive denial of counsel.] Pointedly the Court warned, “[w]e have no doubt that Luzerne County is not alone in facing budgetary limitations, and that the OPD is not the only public defender’s office that faces financial constraints. It is fair to say that both entities are not outliers in Pennsylvania.” Recognizing that their decision “could prompt similar lawsuits in many of Pennsylvania’s sixty-seven counties,” the Court determined that “the potential burden of such litigation cannot outweigh our Commonwealth’s obligation to comply meaningfully and completely” with Gideon v. Wainwright and its progeny. Pennsylvania is one of two states that require local governments to shoulder the entire state burden of funding and administering indigent defense services. (Though Utah removed itself from this classification with its recent legislative reforms, South Dakota is now deemed as providing no state funding for indigent defense services.) Pennsylvania’s county-based systems remain entirely decentralized with no oversight by state government. In fact, the state’s only statutory requirement is that each county must operate a county public defender office. In most counties, the local public defender office is a mixture of full-time and part-time attorneys. In the smallest counties, however, the defender office is a system of one or two attorneys who represent publicly appointed clients purely on a part-time basis. And in the city and county of Philadelphia, the nonprofit law firm “the Defender Association of Philadelphia” is not a county agency, but operates as the city’s primary right to counsel service provider under contract with the city. In all counties, private attorneys who accept appointments on an hourly basis or under annual contract, depending on the county, handle all conflict services. The local judiciary generally directs these conflict systems. There are a number of reasons why the majority of states have moved to more state oversight and funding of the right to counsel. First, most counties have significant revenue-raising restrictions placed on them by state government while generally being prohibited from deficit spending. Therefore, local governments must rely more heavily on unpredictable revenue streams, such as court fees and assessments, to pay for their criminal justice priorities. Unfortunately, there is no correlation between what a county can raise through such alternative revenue streams and the amount of revenue needed to provide constitutionally adequate defender services. For example, the counties that are often most in need of indigent defense services are the ones that are least likely to be able to pay for it. That is, in many instances, the same indicators of limited revenues – low property values, high unemployment, high poverty rates, limited household incomes, and limited higher education, etc. – are often the exact same indicators of high crime. Higher crime rates and a higher percentage of people qualifying for public counsel will quickly drain a county’s limited resources. Those same counties have a greater need for broader social services, such as unemployment or housing assistance, meaning the amount of money to be dedicated to upholding the Sixth Amendment to the Constitution is further depleted. Second, county policymakers are unlikely to be knowledgeable in the nuances of perpetually changing Sixth Amendment case law. Because the right to counsel is an issue of government tyranny vs. individual liberty, the U. S. Supreme Court has been consistent on the right to counsel, regardless of whether the Court has been perceived at any one time as either liberal or conservative. So even though it was the Warren Court that first determined states were responsible for administering and funding the right to counsel in Gideon v. Wainwright, it was the Roberts Court that most recently: a) extended the right to counsel to its earliest point in the adversarial process (Rothgery v. Gillespie County); b) required counsel to explain the collateral consequences of guilty pleas, including immigration consequences (Padilla v. Commonwealth of Kentucky); and c) determined that an indigent defense attorney must be constitutionally “effective,” not only at trials, but in plea bargaining as well (Lafler v. Cooper, and, Missouri v. Frye). Because the Sixth Amendment transcends the traditional divide of partisan politics, it is predicted that the U.S. Supreme Court will continue to require more of both the attorneys defending the accused and the systems in which those attorneys work. County policymakers simply cannot keep up. Though it is not believed to be unconstitutional for a state to delegate its constitutional responsibilities to its counties, in doing so the state must guarantee that local governments are not only capable of providing adequate representation, but that they are in fact doing so. Thus, if Pennsylvania cities or counties are unable to provide adequate indigent defense services, the state – as the original obligor – remains culpable. The Commonwealth of Pennsylvania has limited capacity to assess whether its constitutional obligations under the Sixth and Fourteenth Amendments are in fact being fulfilled at the local level. A number of organizations have noted deficiencies in Pennsylvania’s indigent defense services in specific counties. In 1995, an American Bar Association (ABA) report determined that major impediments caused by “years of neglect” prevent the public defender’s office in Allegheny County (Pittsburgh) from providing minimally effective representation. In the wake of the report, the American Civil Liberties Union (ACLU) filed a class action lawsuit that resulted in limited changes. In 2011, the ACLU published a new report determining that what advances had been made in Allegheny County were then being undone, resulting in excessive caseloads and a failure to appoint counsel early in the criminal justice process. In 2002, the National Legal Aid and Defender Association (NLADA) evaluated right to counsel services in Venango County (Franklin). The report concluded that the county “historically underfunded” the public defender office. The impact was the inability of attorneys to meet the basic parameters of performance, primarily due to excessive caseloads and undue political and judicial interference with the public defenders. An ABA Juvenile Justice Center report looked across Pennsylvania counties and determined that the level of defense advocacy for accused youth at detention hearings was “consistently poor,” with defense counsel in most counties seldom seeking discovery, filing pre-trial motions, or going to trial, because “excessive caseloads” prevented lawyers from having meaningful contact with their clients. All of these reports contributed to two state government efforts to study the problems: the Pennsylvania Supreme Court Committee on Racial and Gender Bias (a 2003 report), and the Joint State Government Task Force on Services to Indigent Criminal Defendants (a 2011 report). Unfortunately, both reports relied primarily on surveys rather than independent data collection, stakeholder interviews, or courtroom observations. Moreover, the reports took as their starting points that Philadelphia more readily meets the dictates of Gideon and its progeny than do all other Pennsylvania counties. But that position was questioned in a DOJ-sponsored report by the RAND Corporation that determined wide gaps in effectiveness between representation by the primary public defenders and assigned counsel lawyers handling murder cases. In 2013, the City of Philadelphia sought to address these deficiencies through the release of an RFP seeking an entity to handle all court-appointed cases in the city. Unfortunately, the RFP was flawed because it did not outline a model that structurally meets nationally recognized standards of justice, such as the ABA Ten Principles. That process was abandoned and the City Council sought technical assistance regarding how best to provide conflict services. The 6AC, under a limited U.S. Department of Justice, National Training and Technical Assistance Center (NTTAC) contract, concluded in a preliminary status report that, when measured against the Ten Principles, the systemic indigent defense deficiencies in Philadelphia are greater than anticipated. Though the deficiencies are more pronounced in the City’s assigned counsel services, neither the primary nor conflict services meet all of the ABA standards. It was not possible to detail all of the issues, given the funding limitations. Under U.S. Supreme Court case law, the provision of Sixth Amendment indigent defense services is a state obligation through the Fourteenth Amendment. Although the Court has never directly considered whether it is unconstitutional for a state to delegate this constitutional responsibility to its counties and cities, if a state does delegate the responsibility to its local governments, the state must guarantee that local governments are not only capable of providing adequate representation, but that they are in fact doing so. Pennsylvania has no institutional capacity to evaluate whether its counties comply with Sixth Amendment case law or not. Pennsylvania is not alone in the abdication of this constitutional duty. Today, a number of other states still rely on local governments to fund and administer indigent defense services, with no state oversight as to whether the right to counsel services are effective – including Arizona, California, Illinois, Indiana (misdemeanors, certain felony courts), Kansas (misdemeanors, delinquencies), Mississippi, Nebraska, Nevada, New Jersey (misdemeanors), New York, Ohio, South Dakota, and Washington.